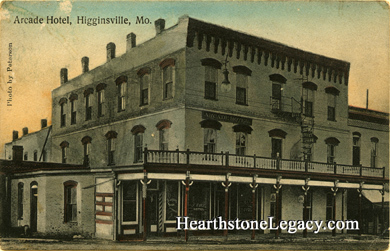 This postcard view pictures the old Arcade Hotel which was located opposite of the Chicago & Alton Railroad Depot. A barber shop can be seen on the ground floor of the hotel. Published by James E. Koppenbrink, Higginsville, Missouri. Printed in Germany. This postcard is postmarked 1921.